This cartoon is from the National Review. I was truly shocked two days ago to learn about the death of William Buckley, Jr., NR's founder and linchpin. 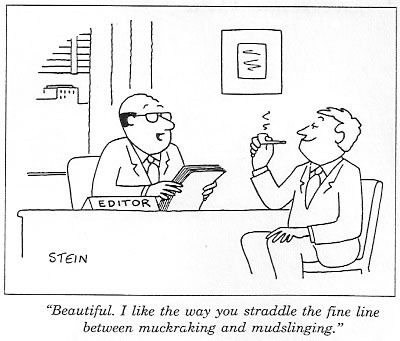 Mr. Buckley's sister, Priscilla, an editor at NR, handled the cartoons there for many years, until her retirement in 1991. No, I didn't agree with most of Mr. Buckley's views, but he certainly made life exciting and entertaining. As The New York Times said in its obit yesterday, "He was often described as liberals' favorite conservative". Amen. And, surely, this will be the first and last occasion that the Times will use the phrase "sesquipedalian spark of the right" in a headline on its front page (look up the word in your big dictionary, as I did). I always liked to imagine that my cartoons made Mr. Buckley laugh. Oh, and I also enjoyed reading his sailing yarns immensely. Rest in peace, Mr. Buckley. It looks to me that in the cartoon of 3/16/92 you are playing with long words as Mr. Buckley did.